Kids, don't try this stunt at home. The entire cast of Star Trek: Voyager has been assembled for a joint interview - around a table in a meeting room at a Manhattan hotel - and it's a most unusual experience. There are jokes aplenty, some of it good-natures picking on each other. There is a great deal of laughter, so loud it almost drowns out the conversation. There are overlapping conversations. And, of course, there is some serious discussion as the Voyager actors reflect on two years passed, days to come and other stuff. Before the 6 p.m. session can begin, everyone must arrive, Ethan Phillips comes early, followed moments later by Tim Russ, sporting a new mustache; Kate Mulgrew; Robert Duncan McNeill and Roxann Biggs-Dawson. Running late due to airport-to-Manhattan traffic are Jennifer Lien, Robert Picardo nad Robert Beltran. One by one, at around 6:15, having checked into the hotel and changed clothes, the three enter the room. Garrett Wang is nowhere to be found, so the conversation begins without him. Starlog: What is working on Voyager? Robert Duncan McNeill: I think that when we started, there weren't any Hispanic role models in Star Trek. Robert Picardo: Are you talking about Roxie or Robert? Robert Beltran: I'm the Hispanic poster boy. Kate Mulgrew: A lot is working. The relationships are deepening. I think our relationship (looking at Beltran) is working. Mulgrew: You're my Hispanic role model. Tim Russ: Beyond expanding the relationships, we've been able to expand on our characters. They went a lot further with my character this season than the first year. Picardo: (To Russ) And you play who? Mulgrew: I think "Meld" really gave you a wonderful opportunity to shine and to explore more of Tuvok, and you really took advantage of it. Picardo: That's my favorite episode of the year, "Meld". Picardo: Really! It was about an issue that had been examined a number of times, capital punishment. To me, though, there was something we learned from it that perhaps we hadn't seen dramatized on TV before. It also gave Tim that wonderful opportunity as an actor to really consider what it would be like to have uncontrollable violent impulses that put you at odds with the rest of humanity. Starlog: What is not working? The main complaint about Voyager seems to be that the ship is just waiting to run into the next alien, who will threaten to kill everyone - but can't - or will tease them about providing a fast way home - nut won't provide it. Biggs-Dawson: We've relied far less on that kind of thing for stories this year than we did during the first year. I don't really see being trapped in the quadrant we're in being a trap at all. I see it as an opportunity. I don't see any difference from what they did in the original series, when they explored space. It was just filled with opportunities. Not being able to go home adds to the possibilities, adds to the drama of it. It only stops where our imagination stops, what our potential is. Phillips: We need to phase out the Kazons a little bit. They're not very exciting. Russ: Yeah, that's the only thing that really wasn't working for all of us. The bad guys we've dealt with every other show just have not been that imposing, haven't been enough of a threat, as it were, for anyone - the characters or the fans - to take seriously. Phillips: I think we should send the Kazon back to the Gamma Quadrant. Picardo: Really, other than their hair, the Kazons aren't too scary. Picardo: Oh, there he is! Beltran: Hey, I know you! [Wang is in a bit of a sweat and explains that he thought the interview was supposed to be held in the hotel's bar. Everyone teases him about being late and his "My dog ate my homework"-style excuse.] If every week we're just trying to get home and that's the sole focus, it will get tiresome. We know we'll last as a show for a few more years, so I don't think we can do it every week, or that we should. Mulgrew: I'm not saying that at all. I don't want to bludgeon everyone with it. But, well, "Basics, Part I" should have been bup-bup, bup-bup, bup-bup, bup-bup.We should have known what was happening. We're Starfleet officers. There should have been more control on our part, especially from the captain's point-of-view. Russ: We had to do some changes on the set to make that work as well as it did. As with any TV show, we are not the writers. We are at the mercy of what come to us from the writers and producers. Some of us fight individual battles on occasion for our characters, to get this cleaned up, or that cleaned up or changed. But the cast, as a whole, has to deal with what they give us, and that's it. When we go out on the street or to a convention, people don't think about the writers and producers. They only think about us. McNeill: Right. They say, "Why did you do that?" Picardo: Once we get a great villain, like The Next Generation has with the Borg, things will get much more exciting. Mulgrew: I think we've got a great villain. The Vidiians are extremely interesting. It's a great-looking alien and there's a mystery to them we can explore. Phillips: The worked great in "Resolutions." We had a lot of action in that show. McNeill: "Deadlock" was good, too. They were great in the one. Beltran: The Kazon don't have much intelligence. So, I don't think we respect them much as adversaries. Mulgrew: That's probably because they're so thirsty all the time! Picardo: Yeah, but if they had water, they would wash their hair and that takes away any of the fun of having them around. Mulgrew: Bob, I remember "Resolutions" very well. Don't you? Phillips: Ug-ub, ug-ub, ur-blub. You remember that Bob, don't you? Starlog: So, Bob, is it true? Are you the king of flubs? Picardo: Well, yeah, I guess. Does that make you all happy?! McNeill: It makes me happy. Mulgrew: In fairness, it's usually the technobabble that gets us. We all have our terrors with the technobabble. Starlog: For each of you, what was your most memorable line of technobabble? Picardo: It's not really technobabble, but the hardest line I've ever had to deliver as an actor was "Before you, I was just a collection of protons held together by a force field..." and it went on from there. Biggs-Dawson: You do it so well now. Picardo: Yeah, but to do it with a dewy gleam in your eyes! "I was just a collection of flotons..."
Picardo: Tough audience! "I was just a collection of protons held together by a force field. I'm a computerized physician doing a job, doing it exceptionally well, of course..."
Beltran: I know the toughest line I had to say. Beltran: "Excuse me, Captain, I have to go talk to my father." He was dead! Fortuately, that line was struck. Mulgrew: Yes, and that was struck, too. Biggs-Dawson: "Look for that there mountain!" Remember that? Garrett Wang: "That there one" Not this one silly, that there one!" Beltran: That whole scene was ludicrous. Janeway says, "Meet back here in two hours." Mulgrew: Well, I had a dandy, I thought: "When did he cease to be a transporter accident and start to be an individual?" Mulgrew: That was "Symbiogenesis" [later retitled "Tuvix"]. It all depends, you have to understand, on who you're working with and where and when you're working. If you're in the briefing room, forget it. Biggs-Dawson: Oh, that's the worst. Mulgrew: The other week, Roxann, you really blew one. Mulgrew: The other week, Roxann. Biggs-Dawson: OK, I lost it the other week. Do you remember "We'd better not transport him to this planet at night because it gets really dark at night." That was a line Kate blew completely. She was supposed to say, "...because it gets very stormy at night." She said, "...it gets really dark at night." I lost it for the rest of the day. Mulgrew: Understand that when we can walk we're safe. If you can walk, you can get away from people. You can blow your line and escape. In the briefing room, you are sitting and staring at each other as they get closeup by closeup. There's no escape. Biggs-Dawson: I can't even look at Kate in the briefing room. Garrett Wang: It's also a problem when we're on the Bridge doing a sequence that goes on for about 12 pages. Say it's a battle sequence and everybody has three lines scattered about and most of it is technobabble. We're writing stuff down on pads and yellow stickies by the season's end. Phillips: In "Investigations," I had a two-page monologue which they could not cut away from because it was me to the camera. I got the scene like a day before. That was hard. You would get a week to rehearse that in the theater. I had to sit in bed the night before and study it. I'm used to doing one sentence, three sentences at a time, but this was pages and it was tough. Biggs-Dawson: I can only remember line if I can dispose them immediately. So, I don't have one in my head. Russ: I can't remember the line. I was about a flower I had to describe. Thay wrote it on way, but the next day they changed it and it was twice as long and it was suddenly all this scientific description of a flower. Lien: Mine was also about a flower, or at least a plant. I had this strange, endless description I had to give about this orchid. It was all about how it was composed, what sort of genes were involved. I just couldn't hold it together. Phillips: My technobabble is usually cuisine babble. It's all about the unpronounceable foods. Wang: The toughest stuff for me is when I'm on the Bridge and I have to do a lot of vigorous shaking while speaking the technobabble. You know what else is strange? When you have one line that comes out of nowhere. It's just not attached to the rest of the scene. It's usually not even techobabble. At the end of "Heros and Demons," I show up after the Doctor saves the day. I have one stinking line. I say "Good job, Doc." Mulgrew: Don't look at me when you say that, Bob. We have learned not to look at each other. McNeill: After someone blows a line, eye contact is a no-no or the whole scene is bust. Starlog: Let's save each of you some time and postage. What's the answer to the question you are most asked? Biggs-Dawson: It takes two-and-a-half hours to do my makeup every day. McNeill: Yes, you can have my autograph. Russ: My makeup takes about two hours to put on. Phillips: I think you're great too, and I'm glad you like the show. And, yes, you can have an autograph. Mulgrew: I don't know yet if Chakotay and Janeway wil really have a love affair. Beltran: I've also been in Nixon and Models, Inc.
Biggs-Dawson: I also get the "Will Chakotay and you have a love affair?" question. Lien: Many of the questions I get are about Kes and Neelix. How did the relationship begin? Will they get married? Have children? McNeill: No, I don't think I'll wind up with Kes. Phillips: Absolutely not! After "Tuvix," where she just couldn't live without me, it's obvious Kes loves Neelix, loves him deeply and richly and needs him. Mulgrew: Kes is the Marilyn Monroe of our show. She's very sought after. McNeill: I don't know what happened between Chakotay and Paris. Beltran: That's true. I get that one, too. There was so much suggested in the pilot and we don't know if they resolved their problems and, if they did, how they did it. Picardo: Actually, Paris and Chakotay did a production of Kiss of the Spider Woman together and have been close friends ever since. The question I get all the time is what will my name be and when will I get it. The answers are I don't know and I don't know. I'm also asked when will I get out of Sickbay, do I wish I could go on Away missions, and do I wish I could go on other sets. Mulgrew: And the answers are? Picardo: Hell no! I don't need to spend five days a week on the Bridge just to say "Hailing frequencies open," I would rather be with my wife and family. Starlog: Almost all of you have been on other shows. Would you say the Voyager cast is tighter than the casts of most shows? Picardo: It's night and day. Picardo: Oddly enough, we don't spend a lot of time together socially, away from work. Biggs-Dawson: That's probably why we get along so well. Russ: We don't hang out, but on occasion we try to get together. Phillips: I had a great time on Benson, too, so it's two great experiences for me. Picardo: We get along better than any ensemble I've ever worked with before. Mulgrew: This is highly unusual. Russ: For this many people, for this many actors to get along is really rare. Beltran: When you think about it, we are nine actors and there is only so much to go around. It would be easy for things to get petty. And it hasn't. Lien: It's an amazing thing. McNeill: It's hard work, so it's a bonus that we get along as well as we do. Wang: I know that two weeks can go by before I see Bob [Picardo], because Kim so rarely has scenes with the Doctor. But when I do see Bob, it's a pleasure. We're all happy to see each other when we get to work. 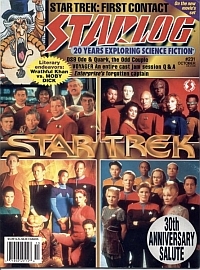 Starlog: Star Trek is celebrating its 30th anniversary. What do you see as Voyager's part in the whole Trek phenomenon, in keeping the Trek flame alive? Biggs-Dawson: That is Voyager's place, to keep the Star Trek flame alive. It's our job to keep it moving, to live up to the expectations and, hopefully, to take it into the millennium. McNeill: It's important to keep it moving. The first series broke new ground. No series had ever done that before and no one had ever done a series anything like Star Trek. It has built it own history and reality and we need to keep pushing and creating new things so that we don't just rely on the history of Star Trek. Lien: We don't want to repeat everything that was done on Star Trek and the other later Trek shows. We need to keep it alive, but we also need to be different. Mulgrew: We're also still in the wake of the enormous success of Next Generation. What I think is key here and what I would love to see is Voyager raised to its critical level, where people call us a different and original show. To do that, we have to be vigilant, the work has to be excellent and it has to be more consistently excellent than we have been. Russ: We also have to bear in mind that there is a new generation of kids coming up. The people watching Voyager are not just people who watched Star Trek in its original run 30 years ago. For some kids, Voyager is their first Star Trek experience. Wang: They don't know Spock from Adam or Kim from Sulu. So, it's really a great opportunity for us. Russ: I think Voyager has continued much of what Star Trek was about, while being, as Kate said, different and original. We've got a multi-ethnic cast, much like the original series. We also deal with many issues but we're different in that we're dealing with modern issues, late 20th century issues. Wang: I think it's important to perpetuate Star Trek. From a fan standpoint, many of them really enjoy the show because they think some of the excitement of the original series has been recaptured. DS9 is on a space station and Next Generation did not explore the universe as much. I think that makes us interesting and different, but also a familiar kind of Star Trek. Lien: We're part of something that's pretty historic on television and part of our culture in America. It's very overwhelming to do that as an art form and to keep it consistently growing. When you look at the original shows and you see what has actually transpired, as far as the technology and the ideals are concerned, it was very optimistic and positive and it showed our promise. It would be wonderful if we could do that, too, and do it in such a way that we are truly unique within what Star Trek is. I don't know if that's possible, but I hope it is. Picardo: On thing that Voyager explores is conflict. Conflict is a reality and it always will be. There is conflict inherent in our crew, which consists of two former enemies forced together to pursue a new, unexpected goal of getting home. That fragmentation of the crew, which I think should be explored far more, would not have been possible on Star Trek or Next Generation, because it was not part of Gene Roddenberry's vision. What I think we're doing for the franchise or the Star Trek myth, is taking it through the 1990s, where we can't support the 1960s idealism of the original series alone. We have to do with the reality that many of the great ideals of the 1960s did not pan out. Beltran: Seriously. She would be fair-minded and have a sense of principles. McNeill: Now, if she was dressed like a Borg that would be another matter. Beltran: Everyone thought she was a wacko, but I wouldn't mind having three or four or five of her on a jury. Star Trek fans are very open-minded. Starlog: What is each of you up to during the off-season? Mulgrew: I was supposed to do a TV movie, but I ultimately declined it. I have two children in puberty. Enough said, yes? McNeill: Is that before or after the one he's doing with me? Phillips: Then, I'm doing Richard III with Sir Anthony Hopkins...again. Actually, I may do a small role in a movie and I'll be doing a lot of flying. Mulgrew: Wait, he sounds serious. Why will you be doing a lot of flying? Phillips: I'll be learning how to fly a plane. Picardo: Oh yeah, there's a plane I would love to be in! I'll be doing a number of Trek convention appearances and vacationing with my family. I have a couple of tiny little things to do work-wise. Lien: I'll be doing a few conventions and just hanging out, doing my thing. Russ: I'll be producing a film this summer and I have a small role in it, too. It's called East of Hope Street. Beltran: Don't be modest, Tim. He co-wrote it, too. Mulgrew: You must be excited, Tim. Russ: Excited is part of it. The right word is probably anxious. Everything seems to be coming together, though. McNeill: I'll be doing the same thing as Bob. I'll be taking a family vacation and doing a few conventions. I've also been watching Jonathan Frakes direct the Next Generation feature. Wang: I'm attending or emceeing every Asian-American event over the entire summer. I'm doing one the Bill Clinton will be at. I'm doing Lollapal-Asia, which is with all these Asian bands. I'll also be doing a few cons. (And, in a perfect George Takei voice): Essentially, I'm doing whatever George Takei is too busy to do. Ah, ha, ha! Beltran: I just got back from Mexico. I did an independent film down there, a political film. We shot in Mexico City and Puerto Vallarta. Starlog: Is everyone ready to do Voyager for another three or four years? Russ: I think so. I think everybody will agree with me when I say the first two years have gone by pretty quickly and the rest of it probably will go by quickly too. Biggs-Dawson: Who wouldn't be excited? There's really a lot left to do. Picardo: Think of all the conventions we can attend! Phillips: And all the money we can make! Picardo: (In the voice of a smooth pitchman) Thanks to your dollars, Ethan Phillips has learned to be a productive member of society. Ethan is now performing on a popular television show called Star Trek: Voyager. Ethan can often say three or four lines in a row without having to stop production for one of his outbursts. We appreciate all of your donations but, just in case, we ask that you keep them coming in. Thank you.